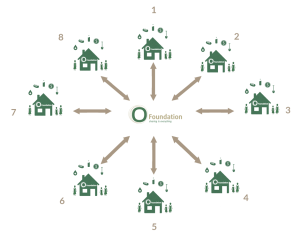 OFoundation has at present appeared over 2 million times in search engine Google. This contributes to the spread of our vision, with which we prove that development can occur sustainably. Additionally, we have attracted more than 200 volunteers, who help us realize our projects. They have organized events, participated in running competitions, and shot films to raise awareness of our vision. Pick your event, fill out the contact form and we we will quickly get down to business! Are you the sporty type and do you want to contribute to sustainability? Organize an ORun and run for a good cause! Are you a party animal and do you like to help other people? Would you like to organize a social responsible event of any kind that supports a good cause? Orginaze an OEvent and support! OFoundation was one of the first to sign the new Sustainable Development Agenda. This 2030 Agenda consists of 169 target goals and is contained in the United Nations Resolution. Together with the UN and other sustainability-oriented organisations, OFoundation wants to contribute to the successful implementation of these Development Goals. Titled "Transforming our World", these goals mutually aim at creating a healthier environment for everyone to live in. This includes the eradication of poverty and hunger, the promotion of health and education as well as investing more in water sanitation systems and renewable enegery. To learn more about the SDGs, click here. The Pitch Event for the CDC was a great success, many participants attended to introduce their promising Business Plans for Micro Franchise Projects in different countries. We are proud to announce the following winners: Western Girls Training Center in Ghana, APPA menstrual kits in Burkino Faso and Web Developers International in Nepal. We will support each of the three nominees with what they need to prepare themselves for the last round, the Partin-Dag coming up in December this year. There, they will get the opportunity to attract investors and meet other interested parties. More than 10.000 people reached on the festival. More than 20.000 on Facebook. More than 120.000 people reached on Facebook. More than 300.000 people reached on Facebook. More than 110.000 people reached on Facebook. More than 60 participants, location Amsterdamse Bos & the Vondelpark. More than 150.000 people reached.